Health organizations across the globe have taken a strong stance against the Trans-Pacific Partnership trade deal, saying it would shoot up drug costs and hurt hamper people in poorer countries. The controversial deal is up for a vote in the Senate on Tuesday to allow President Barack Obama fast track authority in negotiating the deal. The trade measure -- which was largely negotiated in secret among the United States and 11 other countries and involves about 40 percent of the world's economy -- has been criticized for its provisions addressing pharmaceutical companies. The agreement reportedly features patent protections that critics have said would be stifling to generic drug companies that are able to provide low-cost medicines. Those in poorer countries would especially struggle to pay for expensive drugs. The Foundation for Aids Research (amfAR) said in press release that the deal could "greatly delay" low-cost generic drugs from entering the marketplace, and could potentially keep drug prices high for those who can least-afford it. Generic drugs, the foundation reported, are especially crucial for nearly 12 million people with HIV in low or middle-income countries, and have helped achieve the successes in the ongoing fight against the HIV epidemic. The deal could expand what drugs will be allowed to be patented, extend patent protections and make generic producers do costly clinical trials, among other provisions, according to Vox. The trade agreement could also reportedly make it easier to extend a patent length for a minor change and eliminate pre-patent opposition from an advocacy group, according to an AIDS Healthcare Foundation statement. Doctors Without Borders, which often relies on generic medications, has called for changes to the deal, saying in a statement it "would restrict access to affordable, lifesaving medicines for millions of people." 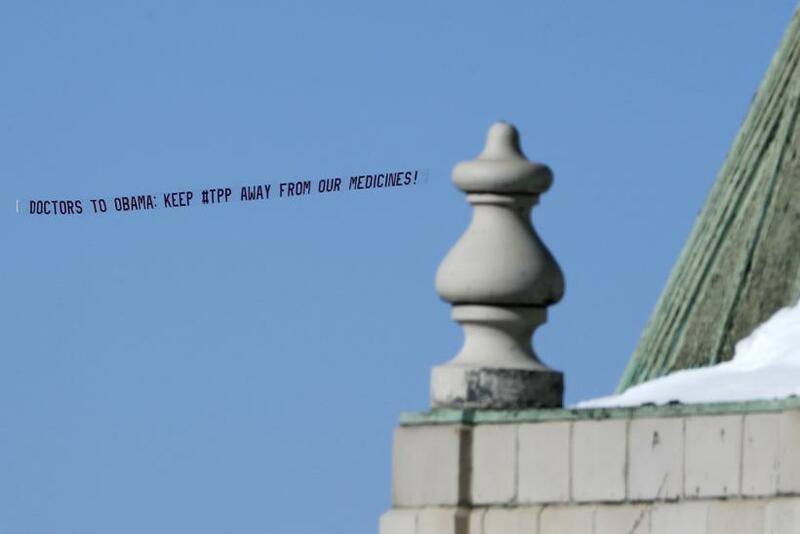 The physicians group has lobbied hard against the measure, even flying planes toting an anti-deal message. "We are doing anything we can to make sure the public is aware," Judit Rius Sanjuan, who oversees the organization's U.S. drug access campaign, told National Journal. A coalition of Peruvian civil society organizations released a statement Monday issuing a warning against the negotiations, saying it could have an effect on the country's ability to acquire medicine, among other complaints. A study by health specialists in Australia -- one of the 12 countries involved in the deal -- was highly critical of the deal, as well, saying it would drive up costs, reported the Sydney Morning Herald. Joseph E. Stiglitz wrote in an opinion piece for the New York Times in January that the trade deal could inhibit generic drugs from providing competition and decrease regulation for big pharmaceutical companies. On the other hand, a Washington Post editorial said that providing a temporary monopoly to drug companies furthers innovation and the trade deal is working to make the system better.